As noted yesterday, the race for Cy-Fair ISD’s School Board Position 5 between incumbent Dr. John Ogletree, Jr. and challenger Bill Henderson has become unusually ugly with Republican precinct chair Ramsay Elder’s funding of a website attacking Henderson. 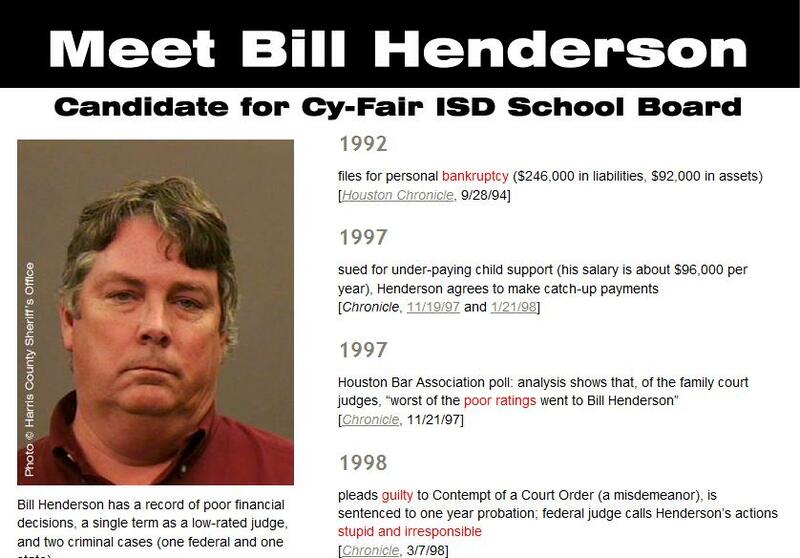 My goal is publicize Bill Henderson’s poor business and personal history, which should embarrass any voter. I have never met with or spoken to Henderson’s opponent or anyone associated with his campaign. As the website says, “Vote for someone else if you want to — just don’t vote for Bill Henderson”. TL reminds its readers that while Henderson is considered the conservative in the Cy-Fair ISD Board race, these elections are non-partisan. Henderson did not return our message for comment. This entry was posted in Candidates, CFISD, Elections and tagged Bill Henderson, conservative, Cy-Fair ISD, Cypress, dirty politics, Harris County, John Ogletree, Jr., NotBill.com, Ramsay Elder, School board election, Texas. Bookmark the permalink.